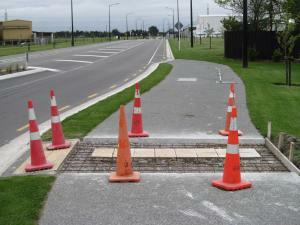 Tactile paving is being laid in 2 locations at the Waterloo Rd/Halswell Junction Rd roundabout at the entrance to the Waterloo Business Park. Regrettably the contractor doing this work has left gaping holes in the footpath around both lots of tactile paving, & have made no effort to fence them off, divert pedestrians/cyclists around them or even provide any advance warning (the fallen over sign seen in the photo is the only sign on site, and it has been in that sorry state since at least Saturday 14-Oct-17). The photo also shows the southbound cycle lane on Halswell Junction Rd being directed onto this section of shared path, and then straight into the hole in the pavement.